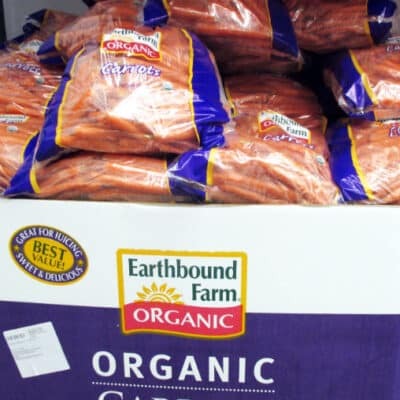 On Saturday, I bought a 10-pound bag of organic carrots at Costco for less than 5 bucks. What can I say? The price was great. That sure is a lot of carrots though. The dressing gives it a little bit of zing, but it’s not too spicy for the kiddos. It’s dairy-free, gluten-free, and just plain delicious. If you’ve never tried jicama, please do! It’s a delicious, mild-flavored root vegetable that has a similar texture to apples. We love it on a veggie tray, in green salad, and in this slaw recipe. We even grow it in our garden. Combine all ingredients and let sit for at least 15 minutes to meld flavors. If you don’t have a mandoline slicer, I highly recommend the Borner V-Slicer. It took me just a couple of minutes to julienne all the veggies–and look how nice and even they are. 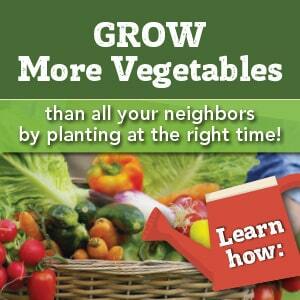 We still have about 6 pounds of carrots to eat…can you share some recipes? And follow along on Facebook as we plow through the rest of the bag. Combine all ingredients in a large bowl. Allow to sit for at least 15 minutes to meld flavors. If you don't have a mandoline slicer, I highly recommend the Borner V-Slicer. It took me just a couple of minutes to julienne all the veggies, and they came out nice and even. 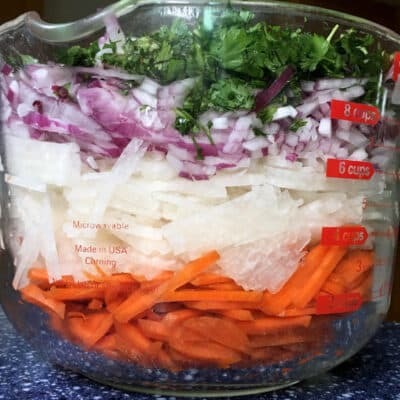 If you (or your family) can’t stand carrots anymore, here’s a soup recipe that freezes nicely. Add the carrots, onions and garlic to a sheet tray, drizzle with the olive oil and season with a big pinch of salt and pepper. Toss everything together so it’s nice and coated. Roast until tender and golden brown in spots, about 45 minutes. Add 4 cups of the chicken broth to a saucepan and bring to a simmer. Pop the garlic out of their skins and add to the sauce pan with the roasted carrots and onions. Simmer everything together for 15 minutes. Add the basil at the very end of cooking. Puree until smooth by adding in batches to a blender or by using an immersion blender. Add the remaining broth, a little at a time, when pureeing to loosen it up a bit. Serve in bowls with some sour cream or Greek yogurt swirled in and Grilled Cheese Dunkers on the side. This sounds really good! 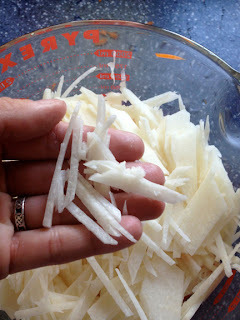 I love how crunchy jicama is! This looks delicious! I do love the bright colors – great idea about the mason jar. I may have to try this on my family. Thanks for sharing! 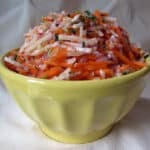 I LOVE jicama, not sure why it never occurred to me to use it in coleslaw before. Genius! Thanks for linking up with the Clever Chicks Blog Hop this week!